Just like people, foam has many roles to perform. During the week, it can be found working hard as insulation, floor padding, packaging or sound treatment. But once the workday is done or the weekend comes, foam has a much lighter side and can be used to make a plethora of toys for any age. The Foam Factory is proud to offer a variety of foam toys, as well as the ability to create your own custom toy designs. The number of toys that can be made from foam is surprisingly large, and many toys made of other materials can be replicated with foam. 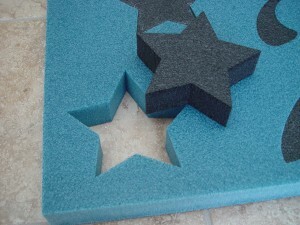 The biggest benefit of foam toys however, and one that cannot be overstated, is safety. The durable, soft forms of The Foam Factory’s foam toys are non-toxic and do not have sharp corners, hard edges or the potential to snap, shatter or break. Instead, foam can be squeezed, stretched, twisted and pulled on. Because of this, foam is an excellent material not just for creating toys to play with, but also for toys to play in, on and around. Perhaps the most recognizable foam toys are swimming noodles, which can be seen at every beach and pool during the summer. These closed-cell polyethylene forms are flexible, extremely buoyant and resistant to mildew, mold, rot and bacteria, making them the perfect water toys for the whole family to enjoy. The Foam Factory provides a range of sizes that can be cut to any length between 17 and 70 inches long. Noodle diameters are available in four sizes, as small as 1 ½ inches or as large as 4 inches, making it easy to find the size that best fits you. Another popular toy is the foam cutout. With a catalog of designs that includes animal shapes, dinosaurs and cars, to stars, snowflakes and oversized hands, The Foam Factory has a wide selection of detailed patterns and shapes in 12 colors for open-cell foam and seven for closed-cell. Beyond their own patterns, The Foam Factory offers the ability to produce any custom shape or design a customer has in mind, using their computer controlled cutting machines. Shapes aren’t restricted to outer silhouettes either, as designs are able to be cut from within a shape for intricate detailing possibilities. Absorbent open-cell foam makes great pool or bath toys for younger children, cut into their favorite sea creatures. When dry, shapes and designs can be used as safe, durable education tools for kids learning about different animals, colors, letters and shapes. Additionally, designs and shapes cut with thicker sections of foam can stand on their own, providing even more possibilities for the imagination. For more adventurous children, foam can provide active and exciting toys to help them expend energy productively. Foam blocks or bricks of lightweight foam can give children the opportunity to build forts and towers, without the weight or hard edges of traditional building block materials. If these structures topple, instead of running for cover, children will be running right into the soft falling bricks! 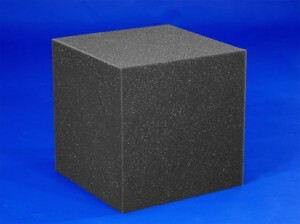 These can be made of colored open-cell foam for cushy, lighter blocks, or closed-cell cross-linked polyethylene foam (XLPE) foam can also be made into for more rigid building blocks for children that hold their shape but are still too soft to support the weight of climbing children. Closed-cell foam can also be cut into interlocking tiles for creating sturdier structures that hold their shape better than open-cell foam building blocks. These tiles can be easily separated and stored, or, reconnected on a flat surface to provide a padded mat for other activities. Tiles can be cut into unique patterns to create larger-than-life puzzles as well, helping develop problem solving skills without the frustration of tiny pieces. Despite excelling as learning tools, toy foam can be used for plain old fun. Cross-linked polyethylene can be cut into circles to make a flying disc of any size, resilient enough to hold its shape and glide, but with softness that won’t jam fingers or break things like hard plastic flying discs. It is also excellent for use in foam crafts. XLPE is extremely buoyant and moisture resistant as well, making it great for fun in or out of the water. Pop-out foam hats are another product The Foam Factory has produced extensively. From bull’s horns to spacemen to octopi, these hats can be as basic as a visor or adjustable for a perfect fit. Shapes and designs are also an excellent inclusion for gift bags or other novelties, like play swords or spirit-boosters for your favorite sports team. So, the next time you think about foam, remember that just like you, it also likes to have fun. The durability and safety that makes it such a useful material in industry also makes for long-lasting toys you can feel good about letting anyone play with – yourself included. Looking to have a company cut some foam toys for me, for me to sell. We may be able to do that. Contact us and send a diagram to see if we can cut the foam to your needs. Looking for a play zone setup for kids to be fitted in around 500 sq ft. If your can company can help me.